So this post needs to be quick, as I’ve spent the past two weeks moving and I’m exhausted. But this dinner was also quick — and hot and comforting. Well, the prep work is quick. It does take about an hour to bake. Keep that in mind. This is the first thing I made in the oven of our new apartment, in the midst of trying to figure out where everything goes. 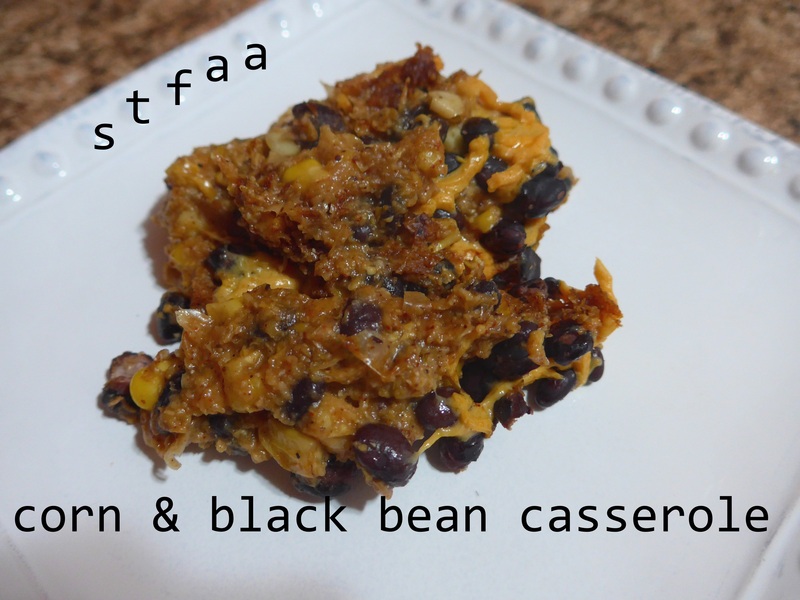 This casserole is based on a vegan corn casserole I made for Thanksgiving this year. Jack’s family makes some interesting corn dish for Thanksgiving based on ingredients that we don’t get out here on the west coast, but frozen corn is easy enough to find. I tweaked the original recipe only to use almond milk instead of soy. For a non-holiday, I’m too lazy to make a fancy side dish (by “fancy,” I mean something that takes an hour to bake and still requires a main course). But I thought it might be easy enough to turn this into a main dish with a few tweaks. 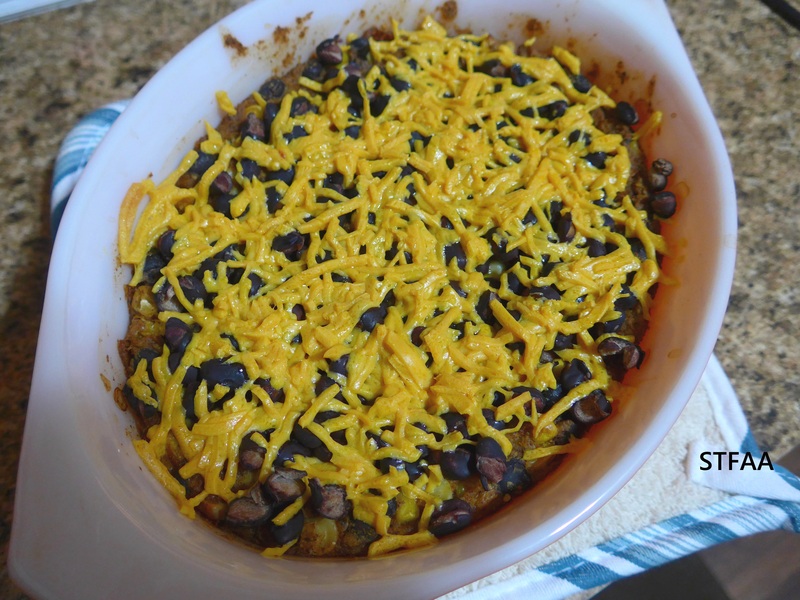 Corn goes well with black beans, and that combination sort of screams chili powder to me, so that’s what I’ve added, along with a black bean, lime juice, and vegan cheese shred “topping” added at the end. So this is a casserole approved for weeknight making, but not for nights you get home late or starving. Plan on maybe 15 minutes prep and an hour ten minutes baking. But your whole meal is done (feel free to add a salad on the side, of course). First, PREPARE: Preheat oven to 350ºF. Grease a 1.5 quart baking dish (you do not need a lid for this recipe). Get out your blender. Defrost 2 cups of your corn. I do this by rinsing it with hot water for a minute in a colander -- I'm going to use the colander to drain black beans as well, and this is quicker than the microwave. Add to the blender the arrowroot and non-dairy milk. Pulse this until mixed. I find adding the arrowroot first keeps it IN the milk. Add the chili powder and 2 cups of defrosted corn. Pulse this down into a rough puree. Then add the oil, baking powder, and corn meal. Blend well. Add the extra few tablespoons of non-dairy milk to get a pourable consistency. I want to say "like pudding," but that's wrong, as you want pudding to be smooth and you want this to be "sandy," which sounds unappetizing until it's baked. Pour this into your prepared dish. Take 1/2 cup of the black beans and set them aside. Add the rest of them, along with the last cup of corn, and mix that into your corn mush. Now into the oven, uncovered. Meanwhile, mix that last half cup of black beans with the lime juice. Let it sit, but you will pour out any extra lime juice before adding. At 60 minutes, you should have a nicely baked top (and probably still need a few minutes in the center, which is fine). Drain the lime juice (the beans needn't be dry, just don't pour lime juice on your casserole) and spread the beans out on top. Then add a good sprinkle of the vegan cheese shreds -- the range is because you want cheese everywhere, but not too thick, and the size of the casserole makes a difference here. Back into the oven for another 10-15 minutes, until the cheese is nice and melted. Then serve and enjoy!